Carson Wentz is an American football quarterback who went professional after he was selected by the Philadelphia Eagles of the National Football League (NFL) during the 2016 draft. As a student at Century High School, Bismarck, he played as a quarterback and defensive back for the school’s football team and also played basketball and baseball. His involvement in athletic activities did not affect his academic work, hence, he graduated in 2011 as his class valedictorian and moved on to North Dakota State University (NDSU) for his college football career. 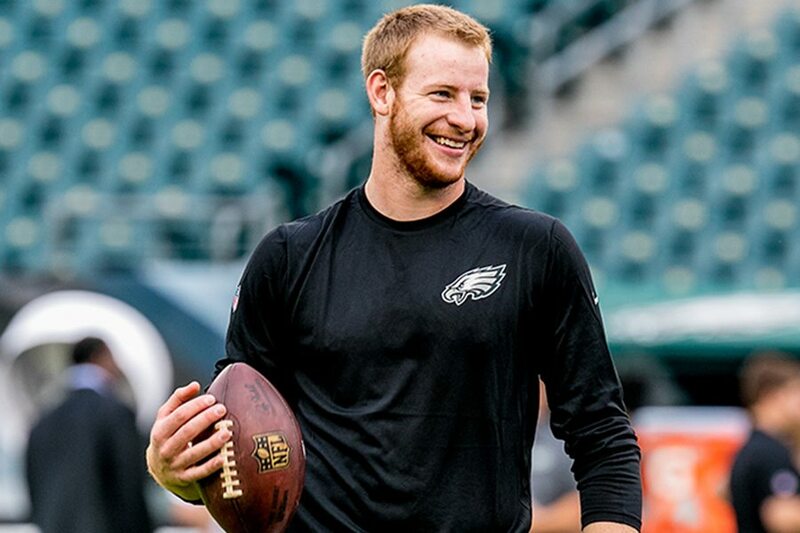 After recording highly productive seasons with the Bison, Carson Wentz graduated from the college with a degree in health and physical education. He finished with a GPA of 4.0 and was recognized by the College Sports Information Directors of America as Academic All-American of the Year. The recognition which he earned twice first came for Division I football and later for all Division I sports. Before the NFL draft of 2016, a good number of sports analysts projected that Wentz will be picked in the mid-first round of the draft. However, his amazing performance on pro day changed things and the analysts started considering him as a top 10 prospects. He also put up a good show at the NFL scouting combine, positioning himself among the top three quarterbacks in the 40-yard dash, the broad jump, and the three-cone drill. On April 28, 2016, Carson Wentz was selected in the first round by the Philadelphia Eagles with the 2nd overall pick. This made him the second quarterback the Eagles selected in the first round of an NFL Draft, the first FCS quarterback selected in the first round since 2008, and the highest FCS quarterback taken in the history of NFL draft. After he was drafted by the Philadelphia Eagles, Carson Wentz signed a four-year deal with the team worth $26,676,338 in May 2016. This included a signing bonus of $17,600,973 with $26,226,338 guaranteed, and an average annual salary of $6,669,085. Consequently, his base salary in 2018 will be $630,000 with a roster bonus of $2,245,122, while carrying a cap hit of $7,275,365 and a dead cap value of $15,763,291. Knowing his exact net worth might not be possible because his annual earnings do not only come from football but also from other private investments. Therefore, judging by his contract and his assets which includes a recently acquired Lamborghini worth about $450,000, a Cadillac, Range Rover, and a Corvette, Carson’s net worth has been variously estimated to be anywhere between $15 and $73 million. The football quarterback was born on December 30, 1992, in Raleigh, North Carolina, with the full name Carson James Wentz. At the age of three, his parents (Doug Wentz and Cathy Domres) moved the family to Bismarck, North Dakota and there, Carson was raised alongside his two brothers, Zach and Luke. His father played football as a linebacker at Northern State in Aberdeen while his brother Zach was recruited as a walk-on quarterback but stayed with baseball full-time at North Dakota State University as a pitcher/infielder. Carson Wentz is married to Madison B. Oberg, daughter of Brian Oberg and Lisa Broughton. She is from Lexington, Kentucky, and has two older sisters named Lauren and Alexis. She attended Ozark Christian University before moving over to the Missouri Southern State University to study elementary education. Madison worked at Ozark Admission in Joplin, Missouri and later joined Mission of the Mobilization Hospitality Team, a mission team that worked in Haiti. In May 2017, Carson took a mission trip to Haiti alongside his former teammate, Jordan Matthews and some members of his church. 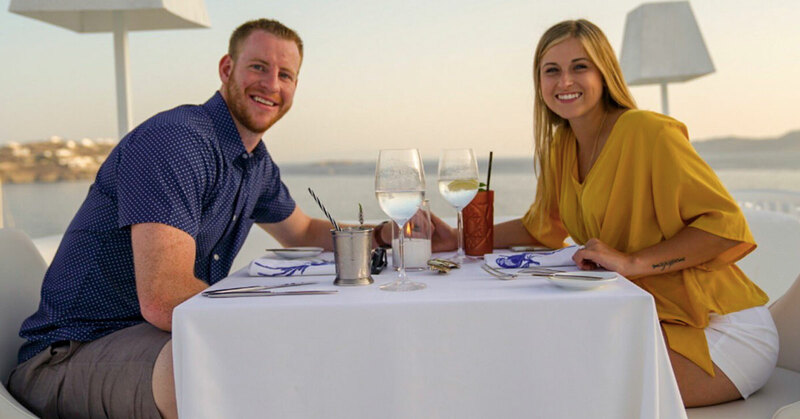 Although Wentz has not directly answered questions on how he met his wife, it is believed that they met on this trip and started dating. She made her first appearance on his Instagram account in December 2017, just after he had an ACL surgery. On February 4, 2018, Carson asked Maddie to marry him right after his team’s 41-33 victory over the New England Patriots in Super Bowl LII. He announced the engagement on Instagram two day later with a picture he captioned “She said YES!”. On July 16, 2018, Wentz announced that he and Oberg had gotten married. The wedding ceremony was said to have taken place at the Lake House Inn in Bucks County, Pennsylvania. The couple shared some of their wedding pictures on social media with the hashtag #WentzUponATime. The newlyweds had a very romantic honeymoon in Greece and while their, they got a matching tattoo which reads “agape”, meaning unconditional love/God’s kind of love. As a high school freshman, he measured 5 feet 8 inches (1.73 m) in height but grew to 6 feet 5 inches (1.96 m) in his senior year. Now, the Philadelphia Eagles quarterback is 6 feet 5 1⁄4 inches (1.96 m) tall and weighs 237 lb (108 kg). According to his pre-draft measurables, he has an arm length of 33 1⁄4 inches (0.84 m) and a hand size that measures 10 inches (0.25 m).